If this card looks a little familiar, have a look at the cover of your Sale-a-Bration brochure. Sometimes the best ideas are sitting there, just waiting to be copied! I didn't even change the colours for my version - I used Watermelon Wonder, Peekaboo Peach, So Saffron and Wild Wasabi. I did change a couple of other small details - the washi tape, the sentiment colours, and I swapped out the ribbon stitching for some copper thread. 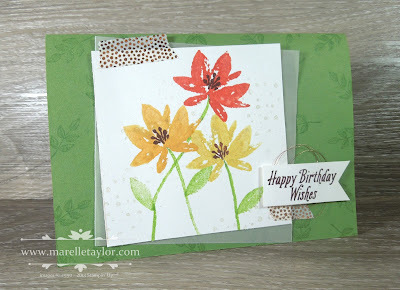 That's the nice thing about copying a card - you can keep the bits you like, and change others to suit your own taste!